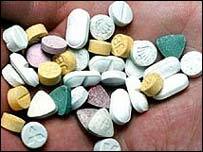 A 20-year-old lifeguard from Ayrshire has died after apparently taking the drug ecstasy. Scott McSephney was one of six people who were taken to Ayr Hospital on Sunday night after falling ill in his home town of Dalmellington. He died in hospital, where another 20-year-old man was said to be in a serious condition on Tuesday. The other four people have been allowed home. It is believed Mr McSephney took ecstasy which had a duck on one side. A spokeswoman said inquiries were ongoing and that a post-mortem examination would be carried out. The force has declined to comment on the cause of his death. However, detectives are investigating two possible lines of inquiry - one is the possibility the drug was part of a "bad batch" and the second is concerning the quantity of ecstasy which Mr McSephney may have taken. The 22-year-old Royal Navy submariner said: "I was very surprised when I heard the news as Scott never spoke to me about drugs. "Like most 20-year-olds he liked going out drinking with his mates but I think he made a bad judgment when he had a drink in him. "It certainly was a shock to find out." Mr McSephney said his mother Mary, 43, and 11-year-old sister Rebecca were struggling to come to terms with the loss. He added: "We just want some good to come out of this. "We just want the lads and the girls round about here to take something away from this. "They need to make sure that they are not around people who have got these drugs as they might be pressurised under the influence. "I would also urge families to keep a close eye on their sons and daughters." Paying tribute to Scott, Mr McSephney said: "He was a very, very popular boy in the Bellsbank area and he was loved by a lot of folk. "That has been reflected in the amount of cards and flowers that we have received." Scott had worked as a lifeguard at the Haven Holiday Camp in Ayr for the last two years. Detectives are uncertain whether the quality of the drug, the quantity of tablets consumed, or both, may have caused Scott's death. The fact five of his friends also experienced a serious reaction has led police to issue warnings about the batch. Strathclyde Police said a 20-year-old man remained in a serious but stable condition in hospital. The other four members of the group were released from hospital yesterday. It is understood all six had been drinking alcohol at the party.